Christine joined City University London in 1996 as a Visiting Lecturer. She ran the Academic Projects Unit from 1998-2009 and developed courses including the MA in Audiovisual Translation, Translation for Media, Subtitling and Audio Description for Film & Television. Christine teaches film production and finance, screenwriting and contributes to a range of other modules, teaching different modalities of audiovisual translation including subtitling, dubbing, voice-over and the translation of screenplays. She also supervises screenplay adaptation dissertation projects. After initially working in film distribution and as a translator for clients including DEFA Babelsberg film studios, Christine came to London in 1986 where she studied Fine Art (Goldsmiths College), Film Production (AFECT, NFTSCU) and Screenwriting (LCC) under Phil Parker. She attended the EAVE programme in 2002. Christine has an MA in Screenwriting, a PG Certificate in Audiovisual Production (EAVE Programme 2002), a BA (Hons) Fine Art (Goldsmiths College), the CIOL DipTrans and is a BAFTA member. After gaining production experience at kd Digital (producers of art films for many Turner-Prize-winning artists like Gillian Wearing and Graham Gussin) and the London Film-makers Coop, Christine set up her own production company in 2001, developing feature film and TV projects. She has also been a script consultant for Euroscript and the Salzburg Screenwriting Prize since 1999, and became consultant and External Examiner for the London Film Academy in 2012 (Screenwriting and Filmmaking Diplomas) advising on programme design and assessment. Christine continues to work as a development producer, with a specific interest in feature films and the US TV market. 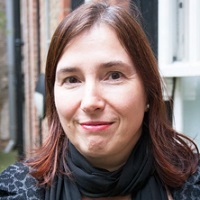 Her other research interests include audio description - the CALLING THE SHOTS project (funded by LCACE) developed Cinematic Audio Description with BBC Radio 3 presenter and audio describer Louise Fryer - and subtitling. She is currently working on a methodology to test BSL and subtitle comprehension - together with Dr Wolfgang Mann (Department of Language & Communication Science at City & DCAL, UCL) and colleagues from UCL and Bristol University. The project received a Pump Priming grant from City. Most recently, she has given papers on the terminology of film production (American Translators Association) and programme design (Monetery Forum, Monterey, California).